With low literacy rates and no television or radio, religion was a powerful force in shaping everyone's values and attitudes in Victorian England. In my research I have tried to discover what motivated Ellen (my great great grandmother) and believe that the effect of religion should not be underestimated with this family. Ellen Moulding (nee Thornley) was Anglican whereas her partner William Moulding was Roman Catholic. William and all descendants in this biography were baptised or married at Preston St Wilfrid's or St Augustine's RC Churches. From my observations of my Catholic father, Protestant mother, various relatives and neighbours and friends, I have decided to apply the following conclusions to my ancestors. I hope it is not too fictitious. Firstly, I have noticed that in general Catholics are stricter with regards to attending mass, saying prayers and confessing their sins. I believe this discipline from an early age encourages acceptance - that the values of the Roman Catholicism and the priest are more important than any other - that fate and God ultimately decide the path of a person's life - that there are things a person has no power over and that money is incidental - some have it and some do not. Perhaps it can be summed up by the belief that there is always someone who knows better and we should be thankful for small mercies. Protestants on the other hand seem to see material success as a sign they are doing well in the eyes of God. By respectable living and hard work a person can do well in the world because God will reward their efforts with material gains. Lack of this success shows a person has not been diligent enough in practising sound personal habits such as temperance, frugality and honest endeavour. Perhaps it can be summed up by the Lancashire saying - "them as 'as nowt is nowt!". To oversimplify - I believe Ellen would have been more ambitious whereas William would have been more resigned to fate and this should be borne in mind while reading this article. I've also drawn a few conclusions based on reading something of the history of the time and applied them to Ellen's family. So please do not take this as gospel, but hopefully any fiction is not far from the facts. Ellen Thornley was born on 25 June 1824 in Leyland. The next documentary evidence is her marriage certificate of 1845. She is a spinster weaver living at Bank Top, Penwortham, which is a hundred yards from Nutters Platt Farm, the home of William Moulding. By 1851 they have moved to 9 Grosvenor Street, Preston, next door to her cousin John Thornley, an overlooker who, because of his position, probably recruited her to work in the mill. Ellen may have had high hopes for her nuclear family in Preston. Working in a boom industry with the possibility of high earnings; a knowledge that other Thornleys were already successful in shopkeeping, tea and licquor trading businesses; and proximity of her peers would have been incentive enough to draw her away from life on a farm and the now unprofitable hand loom weaving. If her cousin Thomas Thornley could help get William and her eldest son John Thornley gardening jobs, it would be the icing on the cake. Note that John Thornley and Ann Thornley were born before Ellen married William and they used the Thornley surname rather than Moulding on many occasions. Was this because they were not fathered by William? 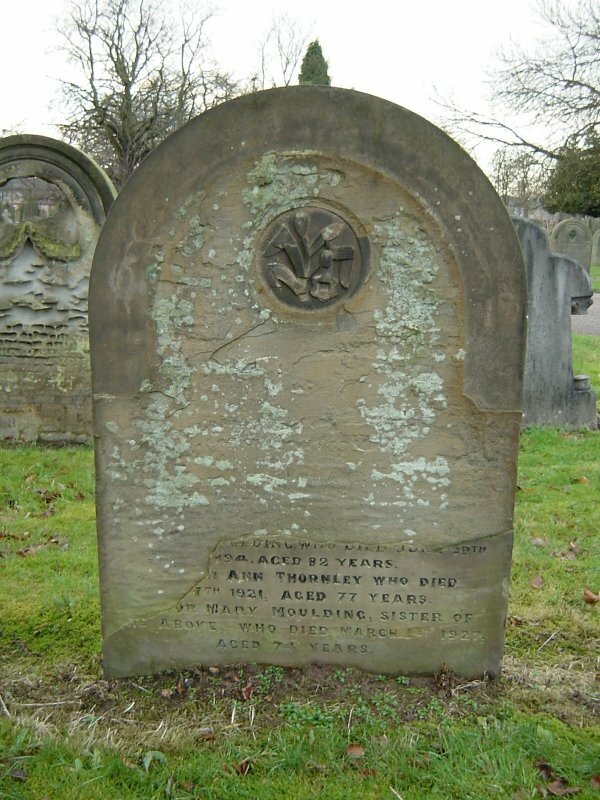 Another daughter, Elizabeth Moulding, was born in 1847 and died from consumption in early 1851. Note Thomas and Ann Thornley are Ellen's parents and Mary Whalley is Ellen's sister. She also had two children before marriage. It would seem that bastardy (the technical term of the time) was not a problem for these families. The next decade saw William Moulding and John Thornley (Moulding) continue in non-cotton jobs while young Ann and Thomas Moulding progressed as weavers, no doubt employed and trained by their mother. The Factory Acts restricted child labour but in practice weavers and employers wanted children to work from an early age. This meant they would be fully skilled and capable of earning top money by the time they were 13 and the employers got a stable, controlled workforce. Children accepted it because they were with their family and other children, learning 'grown-up' things and were keeping warm in the mill. It was often more fun than playing marbles, hopscotch or skipping on windy street corners where ball games were banned. Like other weavers of the time, Ellen probably worked while she was pregnant and had flexible arrangements with workmates, family, neighbours and lodgers around childcare. It was common practice to pay an old lady beyond her working years a few shillings a week to look after the children from 5:30 in the morning till 6:30 at night. Ann, Thomas and Martha all began working in the 1850s and would have also helped with the younger children. So current arrangements suited Ellen and the employers. The Factory Acts were not enforced very much at this time. Young children often did not see their mother for more than two hours a day and this was another incentive for them to work in the mill from an early age. By 1861 Ellen was living across the street and her sister had moved next door. Perhaps discovering why Ellen and family moved this short distance will also shed some light on why hardly anyone in Grosvenor Street (all cotton workers) stayed from one census to the next. Housing conditions and sanitation were major factors. Houses were thrown up without planning or regulation during the 1830s and 1840s in order to meet the demand from a fast growing workforce. Water supply, sewage and drainage were not co-ordinated. There was sometimes one tap for the whole street but water was usually bought from a water cart. Stealing water was a common criminal offence in those days! A midden or boghole or cesspit in the back yard was not drained and had to be manually emptied by "scavengers" who were on piece work rates and so not inclined to visit difficult neighbourhoods very often. The ground floors of houses was often the same level as the streets and had no doorstep. Hence flooding and sewage overflow was common when it rained. 8 and 9 Grosvenor Street backed right up to Ashworth Street and there was no access to the back lavatory arrangements except through the house. The slope of the land made it more prone to flooding than the other side of the street. Numbers 32 and 33 had a back alley and ginnels down the side allowing access for the "night soil men". The slope meant that when it rained the water was likely to run away from the front door rather than under it. Hence cleanliness was the most likely reason for the move. It can be seen how dirty neighbours or those having to empty their own middens by carrying it through the house in buckets and dumping it on the street would not be very popular! There was no other choice at the time but from the mid-1850s onwards sanitation gradually improved as underground sewers were slowly laid throughout the town. Understanding of disease was still limited, however, and fatal epidemics of cholera, typhus, smallpox, influenza, "consumpton" (tuberculosis) and "infantile diarrhoea" (seen as a disease rather than a symptom) continued into the 20th century. It is necessary to know something about the social, economic and political background of the time to gain further insight into reasons for moving and factors that shaped Ellen's family's lifestyle, values and attitudes. Let's just say for now that lock-outs by employers, strikes by workers, growth of unions, friendly societies, co-ops, mutual improvement and education plus the "Cotton Famine" and anti-Irish prejudice all had powerful effects. In October 1862 Arthur was born at 1 Carr Street. As with all the houses in this report, this was only a stone's throw away. Ann and Thomas were now fully-fledged cotton weavers while Martha, Mary and William junior were learning the trade. William senior was a labourer at the gas works and John was gardening so there had been a good income coming into the house during the last couple of years. The 1861-1865 "Cotton Famine" affected everyone in Preston, however, so William and John's non-cotton work would have been a godsend at this time. Edwin Waugh, in his stories about the plight of the Preston cotton operatives, noticed that workers living near Horrocks and Miller's factory were more likely get work. The Preston Guardian newspaper reported some substantial contributions to the Relief Fund by the operatives of this mill. As this was the closest mill to Ellen and family, it is likely they worked there for at least some of those hard times. Judge for yourself by reading Waugh's book and The Lancashire Factory Girl poem both of which movingly describe the desperate plights and brave attitudes of Preston people during the Cotton Famine. In 1868 William voted Radical in opposition to the Conservatives who had gained a huge non-Catholic following with their campaign against the Irish. With rhetoric such as "The Irish keep the wages down" and "the Pope will become the next King of England if nothing is done", the Conservatives, after years in the wilderness, won the 1868 general election. Everyone's vote was published for all to see. 1 Carr Street was a large house with a lamp post right outside. In other words it was desirable because of the savings that could be gained from reading and pursuing tasks by the light of the street lamp. By 1871, however, they had moved to 9 Albyn Street East. This was even smaller than the two-up, two-downs of Grosvenor Street, not having the scullery (small kitchen extension). 1871 Census for 13 Ashworth St, Preston. Why did they take this seemingly backward step to a smaller house without a lamp post? Sewer maps show 9 Albyn Street to be at the end of a sewer and therefore cleaner than houses "downstream" but this does not seem good enough reason on its own. Another reason could be that the landlord of Carr Street had raised the rent for "Popery" supporters. It was convenient to believe the tales of Irish living with their pigs, being drunk all the time and causing trouble with the neighbours even if this was obviously only a tiny minority. The Irish had more people living in their houses than the average so perhaps the possibility of Catholics taking in Irish lodgers gave the landlords an excuse to capitalise. At future censuses some Moulding families had Irish lodgers. Another reason was that the new Lark Hill housing estate was being built. Constant noise and muck was probably not a problem they were too concerned about. But some of the new well-built houses that were springing up from 1868 onwards were for sale. Friendly and Provident Societies, Building Clubs and the Co-ops all encouraged saving and thrift. They provided ways for their members to develop their independence. At some point before 1882 William became the owner of a house on this housing estate. It is possible, therefore, that they moved to a house with lower rent in order to save more towards a family home. With five or six wages coming in they could afford to invest a significant amount. It may have been a typical example of "all bed and work" for a few years, but with an achievable goal at the end of it. In October 1873 the youngest son, Edwin, died from Tubercular Meningitis aged eight. His address was Albyn Bank Street (no number given). In 1876 Martha married. Her address was 23 Albyn Bank Road. By 1881, however, the family had moved to 26 Albyn Bank Road, later renumbered to 53 Albyn Bank Road, which was to become the family home for the years to come. This was a larger house than those around it, had easy access from the street to the back yard, a lamp post and a water point outside. It was on the corner of Albyn Bank Road and Lark Hill Street in a relatively quiet spot, with St Saviour's Vicarage to the west and the Convent to the south with its bank of trees stretching down to the footpath opposite, just a few feet away. As it was at the bottom of a slope, water pressure would have been good but the position was such that any flood water would have drained away on the other side of the street. Building plans submitted were of a high standard. Consequently it would appear that Ellen, William and family had finally found a home they could be proud of, complete with doorstep to donkey stone to their heart's content. Thirty years of struggle in Preston had finally paid off with a home of their own, which was still quite a rarity for a family of cotton weavers. Despite Preston having the highest infant mortality rates in England in the last quarter of the 19th Century (1 in 4 children died before their first birthday), Ellen and William saw their children and grandchildren thrive. John had married a gardener and cotton weaver, Mary Smith, in 1866. She was a widow with two children. Thomas continued mixing gardening jobs with cotton weaving and in 1868 had married Mary Ann Evans, a cotton weaver and daughter of a shoemaker and a grocer. Their seven children became hairdressers, licensed victuallers and shopkeepers as well as cotton weavers so Ellen would have been proud. Martha had married Richard Higginson, a clerk and bookkeeper, in 1876. They went on to have 10 children. You can read something of the life of Martha here. In 1881 William married Mary Jane Hindle, another cotton weaver and one of their children, also called William, became a schoolmaster and for one period was headmaster at St Augustine's Boys School. In 1886 Dinah married John Sisson who was once 'the boy next door' on Grosvenor Street. They stuck to cotton weaving although John's family included watchmakers, joiners and beersellers. With so many relatives living within a quarter mile plus the strong cameraderie that developed from sharing the same work and leisure habits for so many years, these may have been Ellen's happiest times. William made his will out in 1882 leaving his house and possessions to Ellen. In the event of her death any unmarried children were to be allowed to reside there until they married. As it turned out Ellen died in 1893 aged 68 and William in 1894 aged 82. Ann, Mary, Walter and Arthur, all weavers, remained unmarried and lived at 53 Albyn Bank Road for the rest of their lives. They were close to the Higginsons and the Sissons and apparently were devout Catholics. Mary was lead singer for the St Augustine's Operatic Society. (How she retained good hearing while working in the mill must have been somewhat miraculous). In 1872 Ellen was baptised a Catholic. Several factors probably influenced this decision. She must have seen all the prejudice and injustice heaped on her Irish friends (they had many Irish neighbours, all Catholic) and so turned against Protestants. Perhaps she wanted to feel comfortable at her children's weddings. Perhaps religion had become such an issue since the 1868 election that she had to show solidarity with her husband and clear any confusion for her children. The proximity of the Convent and the nuns may also have been a factor. Besides her own four single children, there are several single Mouldings in subsequent generations. For example, William the schoolmaster had four children and two of them became priests. The strongest factor though may have been that her eldest son John (born before she married William) married in 1866 as a Catholic and began to use the Thornley surname again. His acceptance into the Catholic faith would have made it easier for Ellen to also became �respectable� by being baptised. Ellen's aspiration continues today to be carried out admirably by some of her descendants. For other descendants, many without children, the gratitude for a simple routine life remains the stronger feeling. For more about housing and working conditions, take a look at the family tree and the text of photos re Ellen and William. There are also these sources of information.